The documentary followed a news report by Ri Chun-hee, North Korea’s flagship news anchor who long ago officially retired but returns for special editions of the news to announce major breaks in North Korean politics. As with the reports in Rodong Sinmun, the government-run newspaper, North Korean television claimed that Trump had agreed to lift the unprecedented heavy sanctions on North Korea, which both Trump and Secretary of State Mike Pompeo have repeatedly insisted is not the case. The documentary begins with Kim Jong-un departing on a Chinese charter plane from Pyongyang, where a military orchestra was assembled to see him away to Singapore. The images are overlayed with dramatic orchestral Soviet-style music and an overwrought narrator describing the significance of the historic trip. The music does not cease throughout the documentary, even though an actual orchestra only appears in the video at the beginning. “The streets were crowded with wellwishers who were full of reverence for Chairman Kim, who has come to lead world politics with his extraordinary political acumen,” the narrator notes. The movie then cuts to Kim finally meeting President Trump, who is referred to as the “supreme leader” of the United States. Trump can be seen shaking hands with Kim, laughing, and greeting a North Korean soldier, who salutes him before Trump salutes back. Trump also reportedly “expressed respect and endless admiration for Chairman Kim,” according to the short film. Reuters notes that the presence of Ri on screen is a sign that North Korea considers this as important a moment in its history as it has repeatedly stated in its media. Ri was tasked with two of the most important broadcasts in North Korean history: announcing the deaths of founder and “eternal president” Kim Il-sung and his son, Kim Jong-il. “Despite officially retiring in 2012, Ri has come back from time to time to make big announcements. Ri’s image has often appeared on South Korean coverage of major events in North Korea, meaning some South Koreans, associating her with ominous developments, dread her appearance,” Reuters adds. 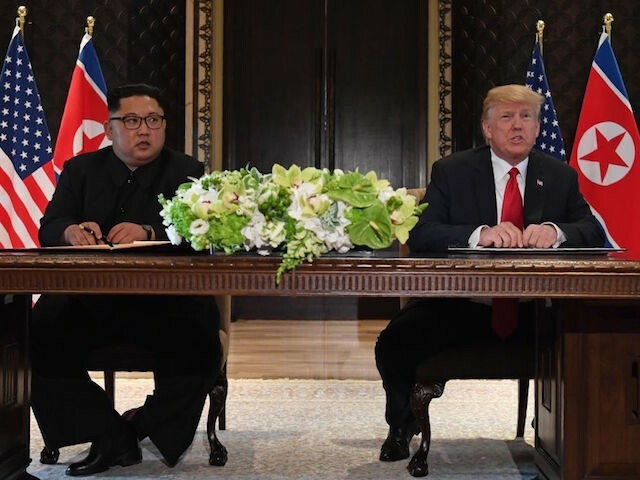 The commentary on television echoes what appeared in the Wednesday edition of Rodong Sinmun, which showcased several photo collages of the Kim-Trump summit and claimed that Trump was ready to lift sanctions on the regime. The prominent featuring of Pompeo and National Security Adviser John Bolton – whom Rodong Sinmun has referred to in the past as “human scum” – suggested that North Korea was ready to change its attitude towards the American leadership. North Korea has not expressed any desire to change its position as the most repressive regime in the world, and President Trump did not indicate that any major conversations on shutting down North Korea’s sprawling concentration camps or allowing any freedom of religion or expression were on the table.